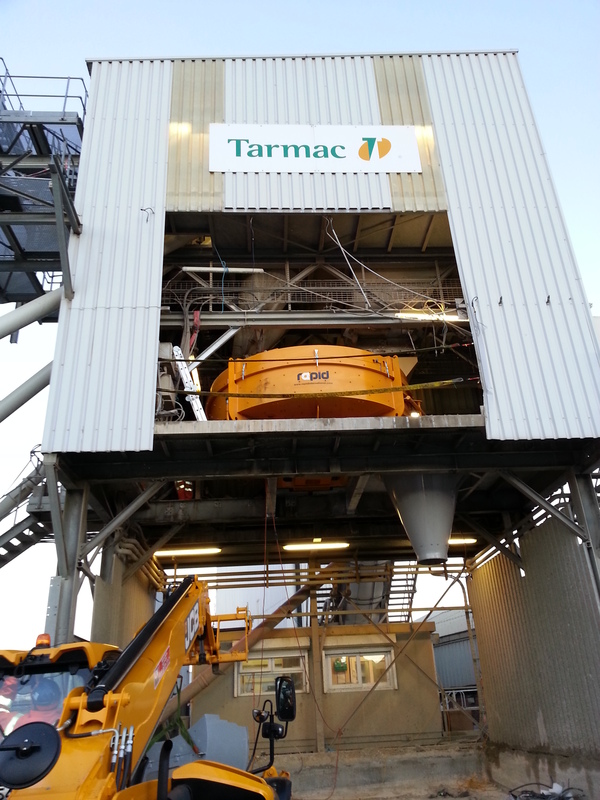 Rapid Concrete Mixer Solves Production Bottle Neck for Lafarge Tarmac, Battersea. Lafarge Tarmac, a joint venture formed following the merger of Lafarge UK and Anglo American’s Tarmac, is recognised as the UK’s leading construction materials and services company, combining both company’s cement & lime, aggregates, ready mix concrete, asphalt and asphalt surfacing, maintenance services and waste services businesses. The company recently installed a Rapid R4000 Pan Mixer at its Battersea production facility in an effort to both modernise and increase its production capabilities. 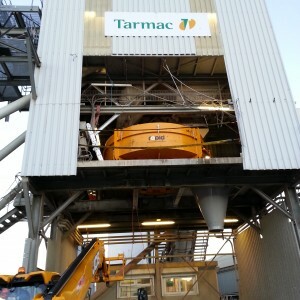 Recognising a need to increase plant output capabilities at its Battersea facility, Lafarge Tarmac chose to replace another brand twin shaft mixer with a new Rapid R4000 4.0m3 output capacity pan mixer. Whilst the previous twin shaft mixer was capable of producing concrete at adequate speeds, the single charging position for the ready mix trucks meant that the time it took to move a full truck out, line up and park the empty one for loading led to a production bottle neck. The distinct advantage in this case of the Rapid R4000 pan mixer is its two doors, which provide two charging positions enabling one truck to get into position while a second is still being loaded. Despite the slightly smaller output of the mixer, production is expected to increase by up to 50%. The self proclaimed ‘Home of the Concrete Mixer’, Rapid’s core product range of pan, planetary and twin shaft concrete mixers are the culmination of over forty years of experience, and stand alongside its celebrated existing portfolio of mobile batching and continuous mixing solutions. Rapid’s R4000 pan offers the largest output of its kind manufactured in the UK and for this reason is ideal for applications where output is key, in particular the production of ready mixed concrete. Rapid’s range of pan mixers offer outputs from 0.5m3 to 4m3 per hour. With a great emphasis placed on durability and ease of use, standard equipment includes durable chill cast wear sleeves, paddles, wall and floor tiles and heavy duty discharge door mechanisms. The mixer can be easily accessed for cleaning and maintenance due to the fact that the access lid is one quarter the size of the mixing zone and there are less technical components. Consistent top quality homogenous mixes are achievable as a result of mixing arms that ensure all materials are kept in constant motion in every direction. All Rapid concrete mixers are customisable using a wide range of optional extras including but not limited to the addition of up to three hydraulic/ pneumatic discharge doors, mixer starter panels, mixer interlock system and a mixer monitoring protection package. Rapid’s dedicated and experienced in house spares department has the ability to provide Lafarge Tarmac with all its wearing and replacement parts requirements for the Rapid R4000 pan mixer, via a fast track service. High inventory levels and same day dispatch from stock on goods ordered before 11am (UK only) will ensure that the company’s spare parts requirements are consistently met in a cost effective, timely and efficient manner. As a result of its high outputs the Rapid pan mixer range is ideal for ready mix concrete production, as well as production of concrete blocks and bricks, grouts and screeds, pre cast concrete and interlocking paving.